BikeSpike goes on sale next year. It’s a LoJack/Onstar system for bicycles and it only costs $129.00 when you preorder. This will come in handy for all you bicyclists out there. Frame locks like these also work best when you have to park the bike momentarily, like onto the front of the bus. If the victim had one in place, then the crook wouldn’t have made such an easy getaway; he would’ve had to carry the bike to make his escape. I feel kinda sad for the victim. He paid $1,300 for his bike when all it could’ve taken was $60 worth of hardware on Amazon.com to prevent the crook from making an easy getaway. Thanks for reposting my story. Let this be a good reminder to those that it could happen to you. I’ve taken my bikes on bus hundreds of times prior without incidents. It only takes one time for a thief to run off with it. Just lock one of the wheels with a short rope lock (to the frame, not to the bike rack). 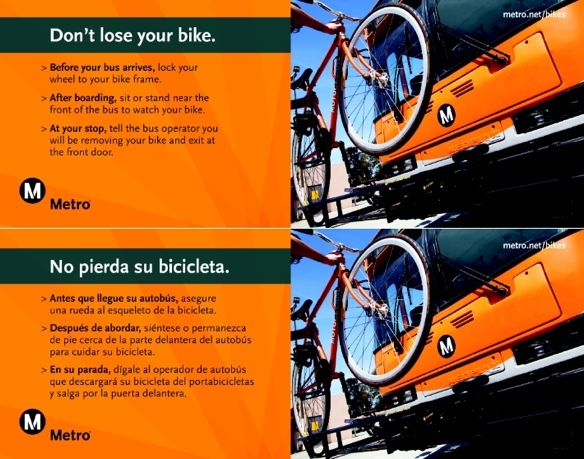 When leaving the bus, lift the bike up and unlock it on the sidewalk. Anything obvious to show the would-be thief your bike is not an easy target. @ElijahR & @Alex – I’ll be doing the same now. Locking my tire and frame before I put the bike on the bus. I’m still a little gun shy about taking the bus with the bike. It’s going to be just the train for now until I ease back in it. Folding bikes are also an option, which can be carried on and also eliminates the issue of when the bike rack gets full (which is happening increasingly on the popular routes, especially during peak).